Celebrate family gatherings with this extra-special, extra-large selection of delicious sweet and savoury gluten-free food and drink. A heady mix of indulgent treats and delicious comfort foods, it has something for everyone. For the sweet-toothed in the family, there are sensational bakes chosen especially for the texture and taste, as well as preserves, chocolate and fudge while for those with more of a savoury sway, there are pates, cheeses, soups and organic pasta sauces. Please read the complete listings below. Sweep away the challenges of gluten-free catering, the XL family selection gift hamper will be hand-packed, elegantly wrapped and delivered to the door. 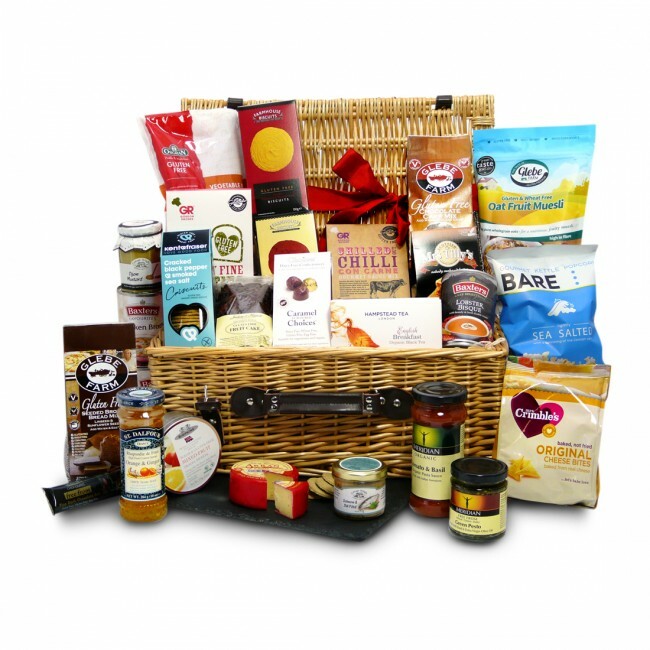 If your family members travel far and wide to meet up at Christmas, arrange for this gift hamper to be there to greet them. The gluten free food and drink in the XL Family Selection Hamper is carefully packed by hand in a gorgeous red gift box. If substitutions are required, you will receive items that are the same (or higher) value and that will compliment your original selection.